Provide comfort for the family of Peter Verduin with a meaningful gesture of sympathy. 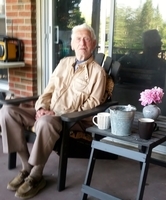 Passed away peacefully at Dufferin Oaks on Thursday, December 6, 2018 at the age of 93. Loving husband of the late Daatje. Beloved father of Greg (Mary) and Steve (Susan). Proud grandfather of Matthew (Cecelia), Terry (Robyn), Peter (Sara) and Katie (Chris) and great-grandfather of Arabella, Elliott, Sam, Will, Emma and Owen. A private family service will be held at a later date. If desired, donations to the Canadian Cancer Society would be appreciated. Our sincere condolences to your family for your loss of a wonderful Father and Grandfather. This time of year with Christmas so close is always difficult, so we will keep you in our thoughts and prayers.